Last Tuesday 7 February The Matheson Trust and The Woolf Institute celebrated together the UN World Interfaith Harmony Week 2012. On the grounds of St Edmund’s College, Cambridge, representatives of five major religious traditions joined us to share with the audience live performances of some of their most significant prayers and sacred songs. 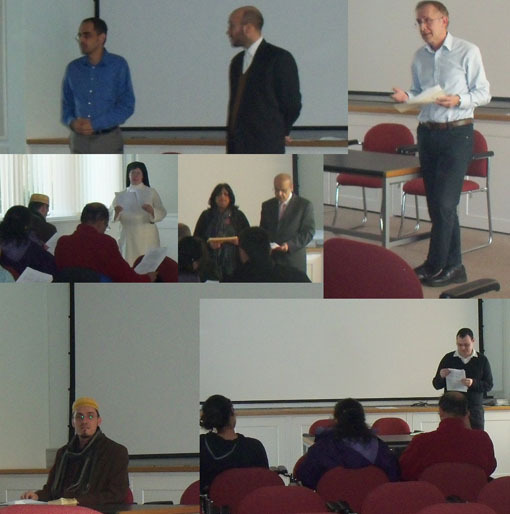 After a brief welcome and introduction by Josef Meri and Juan Acevedo, the different presenters gave voice to the Vedas, the Buddhist scriptures, the Torah, Christian hymns and the Qur’an for a truly exceptional and inspiring afternoon. “The pitfalls of expression are always lurking in interfaith exchanges, and those engaged feel as if treading on thin ice lest they are misinterpreted and then misquoted and misjudged… how could it be otherwise, if what is involved is trying to express what is beyond words and even beyond language? Please follow this link to our Library for full details and to listen to the audio recordings.